The combat myth is a narrative that verifies the victory of the forces of order over chaos and its manifestations, whereas the apocalypse takes this triumph to its immanent conclusion of annihilation: chaos will be eradicated forever in a decisive encounter with order. Thus, the maintenance-to-removal shift signifies the latter’s divergence. Taking this into account, the apocalypse in Revelation is a logical outgrowth of the combat myth. Agreeing with Cohn’s assessment of Revelation, I will analyze the combat myth as a necessary condition for the Christian apocalypse. Indeed, the apocalyptic faith internalizes the combat myth to justify the need for “a new heaven and a new earth” (Rev. 21.1). The diametrically opposed divisions of nature in Revelation are underscored to imply that harmonious coexistence is impossible. Chapter 12 of Revelation initiates the combat myth by focusing on three figures: the sun-clothed woman, her son, and the dragon. The woman, a symbol of Israel or the Virgin Mary, is the progenitor of “a man-child, who [is] to rule all nations with a rod of iron” (Rev. 12.5). Thus, the man-child’s ontological purpose is to establish the ordered world through Christianity. 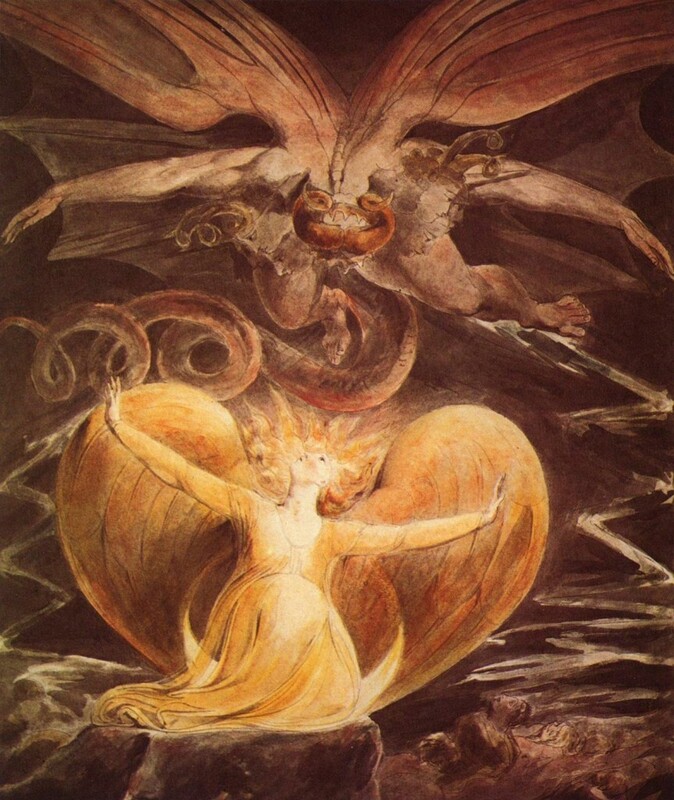 Nevertheless, the dragon-Satan is infinitely opposed to this notion. Representing primordial chaos, the dragon-Satan—defying any symmetry with the natural world—is an abomination with seven heads. 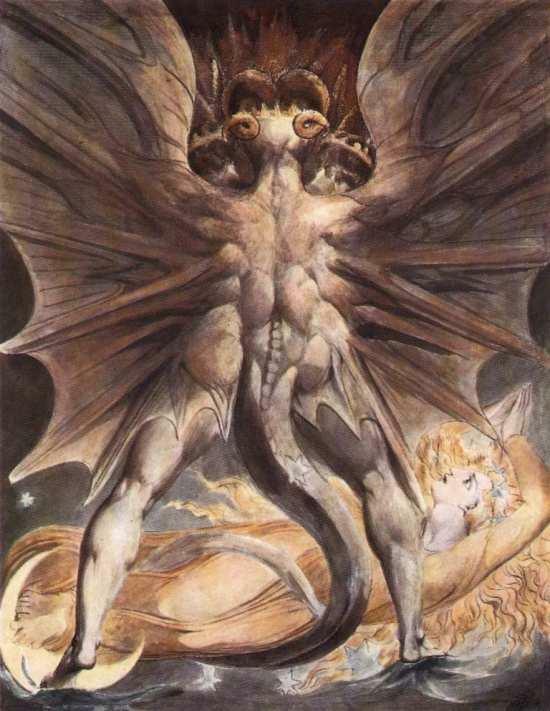 The tail of the dragon-Satan suggests a predisposition to disunity because it casts down the stars of heaven. Furthermore, the effect that these figures have on the scene’s light imagery inherently reveals their dichotomous characteristics: the sun-clothed woman of brightness and the dragon-Satan of darkness. Following the diabolical logic of persecution, the dragon-Satan attempts to assassinate both the sun-clothed woman and her son. However, providence intercedes on both accounts. With the constant threat of chaotic forces at work in the cosmos, the apocalyptic faith inescapably appoints a figure to champion its cause. The supernatural champion in Revelation’s combat myth is limited to the conservation of the ordered world, which foreshadows the final skirmish between heaven and hell. Acting in accordance with providence, Michael and his angles cast Satan out of heaven to confine his corrupting influence to earth. This sequence of events conforms to the plot-motif of the combat myth. For instance, Ra embarks on a daily journey to suppress Apophis (Cohn 21-22). Since this conflict effectively is at equilibrium, the outcome inevitably approaches a zero-sum fatalism: neither chaos nor order will be destroyed, yet each entity is obliged to eternally struggle. The stalemate between these opposing forces is, nevertheless, mitigated by a cosmic promise: “He that leadeth into captivity shall go into captivity: he that killeth with the sword must be killed with the sword” (Rev. 13.10). Although the tribes of Israel may be maltreated, their tormentors will experience retribution that is equal to—perhaps even greater than—the Draconian measure. In this sense, Satan’s war with the remnant seed foreshadows the battle at Armageddon. The Zoroastrian-Christian teaching that the remaking of the world requires the resolution of social conflict reinforces the impetus of the maintenance-to-removal shift of the apocalyptic faith (Cohn 114-115). Indeed, the tribes of Israel seek to improve their lot. The conservatism of the combat myth is replaced by the progressivism of the apocalypse, which results in the revolutionary reworking of the universe. Paralleling the structure of the combat myth, Jesus, during the battle at Armageddon, assumes the appointed role of champion; yet, unlike Michael, his prowess is limitless in his manifestation as the warrior-messiah. Echoing the description of the sun-clothed woman and her son, the seven stars that Jesus carries complements the fact that “the sun shineth in his strength” and countenance (Rev. 1.16). These intense images of light signify the warrior-messiah’s role as an agent of order. 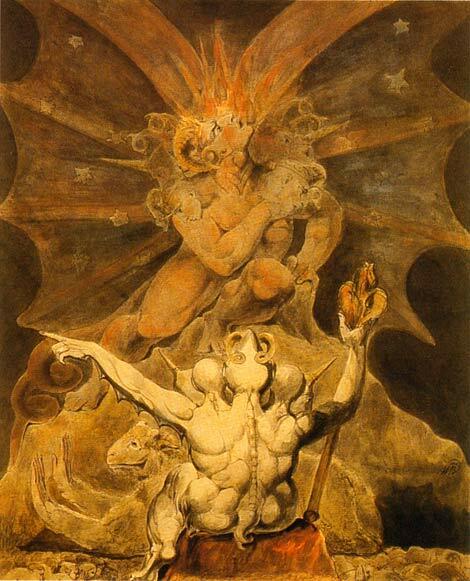 Again, the dragon-Satan and the false prophet resurface to defy the defender of the ordered world. Consequently, the dualistic conflict presented by these entities must now be resolved: in particular, chaos must be eliminated so that humanity can return to its original innocence. This cosmic triumph is achieved through the warrior-messiah’s spiritual power, which is expressed in the mouth-sword metaphor. Specifically, the mere speech act of Jesus is capable of eradicating and confining chaos to its fate. Therefore, the apocalypse can be viewed as the conclusion of the combat-myth cycle. The settling of universal scores, furthermore, enables the possibility of establishing an end-time Eden. The Christian apocalypse ultimately originates from the need to surpass the conflict dualism and zero-sum fatalism of the combat myth. Moreover, the striking parallels between the combat myth and the apocalyptic faith undoubtedly suggest an influential—if not evolutionary—relationship. Since Christianity is a religion that calls its adherents to prepare for the hereafter, the conservative-to-progressive shift that is needed to facilitate the reemergence of an end-time Eden is a powerful drive in channeling human effort. When rhetorically and unethically applied outside of its theological context, apocalyptic discourses can be used to justify the unimaginable. In this sense, radical and heretical demagogues can easily command vast amounts of violence in the name of an unjust cause at the mere breath of a word. Cohn, Norman. Cosmos, Chaos, and the World to Come: The Ancient Roots of Apocalyptic Faith. New Haven: Yale University Press, 1993. The Holy Bible. King James Version. Nashville: Thomas Nelson, 1987.